High quality stud earrings can be difficult to find, but these yellow gold Petite Budded Cross Stud Earrings from Apples of Gold Jewelry are the perfect stud earrings for daily wear. 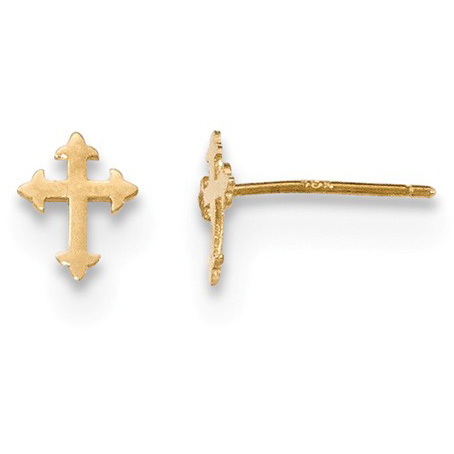 Feel free to wear these 14K yellow gold stud earrings, which feature petite budding crosses, and measure 6mm in width and 7mm in length for size, during church, work, school, or while you are out and about. The stud earrings will capture the light with the warm yellow gold, and allow you to feel connected to your faith. We guarantee our Petite Budded Cross Stud Earrings in 14K Yellow Gold to be high quality, authentic jewelry, as described above.